CCTV security cameras are used for a variety of reasons. They can be installed in your home or business to monitor activity. CCTV cameras send their images to a closed circuit. That means they can not be intercepted like broadcasting signals. Most business owners, corporations and residents prefer the use of CCTV camera security systems. Boca Raton residents often install home security cameras to protect their home from vandalism. Businesses in the area use these cameras to monitor employees, warehouses and parking lots. There are a wide variety of security systems available and your needs depend on which camera system is best for you. Internet Protocol cameras transmit their images through a LAN line. LAN stands for local area network and this is also how your Internet connection works. You must have an Internet connection in order for an IP camera to transmit images. IP cameras are available wired or wireless. Most people have opted for the wireless cameras because of its ease in installation. These images can be viewed from any electronic device that is connected to the Internet. 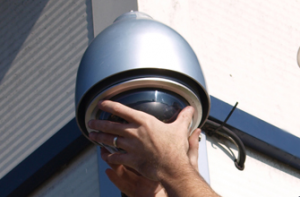 IP cameras are an inexpensive choice for home or business security. They are not often used in large corporations because other camera types are best when you need many cameras. There are three common styles of security cameras. Bullet, domed and pan, tilt and zoom cameras. Bullet cameras are the type of cameras you often see at small businesses or residential areas. They are shaped like a bullet and intended to be seen. Domed cameras are often found at banks, shopping centers and department stores. The domed camera has a black screen that prevents you from seeing the angle of the camera. The intention is to hide the angle so potential shoplifters, robbers or other thieves can’t tell where the camera is recording. Most of these cameras have a wide angle and can record images from a large area surrounding the camera. Pan, tilt and zoom cameras are often located in parking garages or other areas where the camera needs to be mobile. These cameras are installed with motion sensors. When they detect motion, the camera will tilt and zoom in order to get a better view. Security systems that are monitored live by professional security guards are often used at large companies such as dealerships, large corporations or airports. The images are sent to a central room where one or more security guards monitor the images in real-time. This is a great way to reduce crime but cost the most. Some companies don’t monitor their images in real-time and only review them if there is an incident. Monitored security systems are often used in hospitals, prison systems and some school districts. If you decide to have security cameras installed in your home, you must decide whether to choose professional alarm monitoring or monitoring the system yourself. If you decide to monitor the system on your own, keep in mind that it will be almost impossible to watch your home at all times. If you work during the day, consider hiring a professional alarm monitoring company. The monthly costs for this service is minimal. Install security cameras around the outside of your home. You want your cameras to be seen. A potential thief will think twice about breaking into a home with cameras. They will often choose another home rather than risk getting caught. Decide whether you want to rent or own your own home security equipment. It is often cheaper to own your own equipment in the long run. Business owners have many things to worry about including security. A business can lose a lot of money through employee theft. Many companies now use CCTV cameras to monitor their employees. These can be placed near cash registers, storage rooms or even hallways. The goal is to catch the employees that choose to steal. They also look for employees who steal time from the company by not working during work hours. This is often called stealing time from the employer. A key area that needs to be monitored at most medium to large size businesses is the parking area. This is especially true if the company is open around the clock. Installing CCTV cameras in the parking area will also help protect employees when they walk to their car. Home security is an important subject to many families. If no one is at home during the day, you could come home to an empty home. Think of the money you would lose if a thief broke into your home and stole your valuables. Installing a home security system will cost much less. This will also give you and your family members peace of mind. The most important part of owning a home security system is to actually use it regularly. Thieves know that many people simply don’t turn their system on when they leave. A common thief will watch their target for a few days before striking. If you don’t use your security camera, you are risking an intrusion. Many people make the mistake of buying a large screen television set and placing the empty box out by the curb. This is a red flag to a thief that your home might just be worth risking. The common thief imagines that if you have the money for a large television, then there must be other valuables in the home. Summer is a popular time for thieves to strike. That’s because they know this is when most people go on vacation. The kids are out of school and they may be gone for one to two weeks. This gives a thief plenty of time to break into your home and steal all of your valuables. Make sure you store your valuables in a safe that can not simply be carried away. You should choose a wall safe that is hidden from view. You can also place your valuables in a safe deposit box. This is inconvenient, especially if its jewelry you want to wear from time to time. Protecting your home from vandalism requires combining a variety of security methods that work together to enhance your security. A home security alarm alone may not protect you and your family. Response times vary from law enforcement agency, but you can bet your local thief knows the response time of your law enforcement agency. They might assume they have plenty of time to take your valuables before law enforcement arrives. The most common point of entry into your home will be one of your doors or windows. If you fortify your windows and doors, you can reduce the time it takes a thief to break into your home. A thief is looking for easy targets. They want to spend no more than a couple of minutes kicking in your door. If you buy high-quality steel doors and install deadbolts, you will reduce your chance of becoming a victim of crime. However, the deadbolt must be installed correctly to keep an intruder from entering your home. Consider using a professional for this job. Door and window sensors are available that detect breakage and sound a loud alarm. The one thing common thieves don’t want is to make too much noise. They know a neighbor may hear the alarm and call the police. Getting to know your surrounding neighbors is a great way to improve your security. You can offer to watch their home when they go on vacation and they will watch yours. Neighbors who form a watch team can significantly reduce the amount of crime in your area. There are also neighborhood watch programs that help to reduce crime. Find out if there is a group in your community by contacting local law enforcement. Neighbors who stand together can make a significant difference in the safety of the community. Another common entry point for thieves is the garage. Some people will leave their garage door openers in their vehicles park on the street. This makes it a simple job for a thief to steal your remote and wait until you leave to enter your home. The other important thing about the garage is the fact that there is a door inside that leads into your home. If a thief gets inside your garage, they are able to take their time breaking into that door. They will be hidden from sight from the neighbors and free to use any garage tools to help them with the job. When you leave for vacation, secure the outer garage door by locking it from the inside. You should never buy a garage door that is equipped with windows. This will give a thief a look at what you have in your garage. If it is expensive sports equipment, they may decide to take the risk and break into your garage.